It's a dawn of a new era for the UFC. The promotion made its debut on ESPN on Saturday at Barclays Center in Brooklyn, New York, and on a card where so much happened, there were a number of important fights that got lost in the shuffle. There's plenty to examine on what turned out to be an amazing night of fights, and below are the top 10 storylines emerging from UFC on ESPN+ 1. 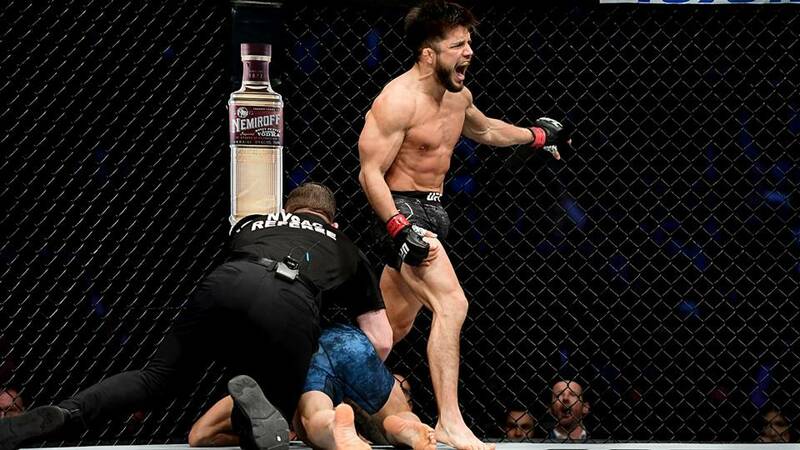 It was an amazing night for Henry Cejudo, as he shocked the MMA world and brutally knocked out TJ Dillashaw just 32 seconds into the first round of the main event. 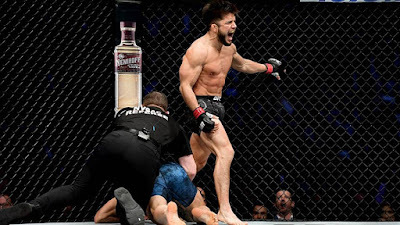 Cejudo caught Dillashaw in a good spot and kept hitting him until the referee stepped in. Wow, just wow. 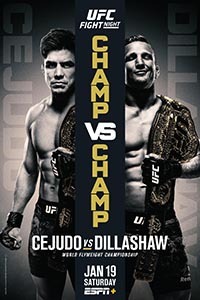 Cejudo has now defeated Dillashaw and Demetrious Johnson in his last two fights and has to be one of the best pound-for-pound fighters on the planet. He also may have saved the flyweight division with this victory. If the flyweight division sticks around, he should fight Joseph Benavidez, who defeated Dustin Ortiz earlier on the main card. Dillashaw should go back to bantamweight and defend his belt against the top contenders there. 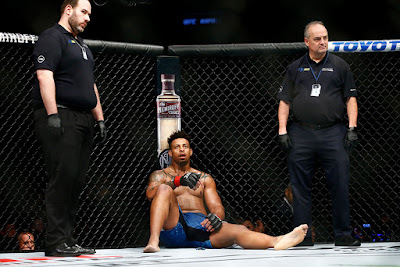 The UFC debut of Greg Hardy drew fascination from the MMA world and the sporting world in general, but it did not go as planned. Despite being heavily favored to win, Hardy struggled with Allen Crowder in what was by far the toughest test of his MMA career to date. Crowder was able to survive the big punches of Hardy early on and use his wrestling to slow him down. Then when it looked like Hardy was turning things around and might win, he landed a vicious illegal knee to Crowder that cost him the bout via disqualification. It couldn't have been a worse ending for Hardy's debut, and on ESPN+ to boot. One of the most underrated lightweights in the UFC is Gregor Gillespie. He improved his UFC record to 6-0 with a brutal TKO win over Yancy Medeiros, and it's a win that should get him noticed by the fans, media, and UFC matchmakers. Five of his six UFC wins have come by stoppage, and he's quickly rising up the ladder at 155 lbs. The UFC needs to give this guy a step up in competition. He needs a top-10 opponent next, if not a top-5 opponent. At age 31 he's in his prime. This guy could be the dark horse future champion in the stacked UFC lightweight division. Although it would have been a nice story to see Rachael Ostovich come back from her domestic assault and get a win, Paige VanZant wasn't letting that happen. 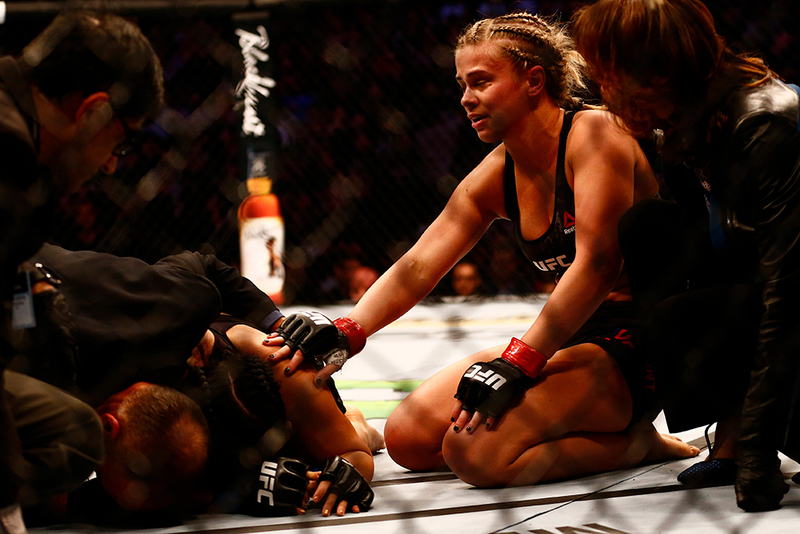 VanZant found a way to get the submission in the second round and return to the win column after a long layoff due to a broken arm. With the women's flyweight division wide open right now, VanZant could be just a few wins away from a title shot. As for Ostovich, she's now 4-5 as a pro and there's no sure thing that the UFC offers her another fight. He was counted out yet again, but 39-year-old Glover Teixeira turned back the clock and survived an early knockdown to finish Karl Roberson. Teixeira might not be a title contender anymore, but he's still an extremely tough gatekeeper at 205 lbs. 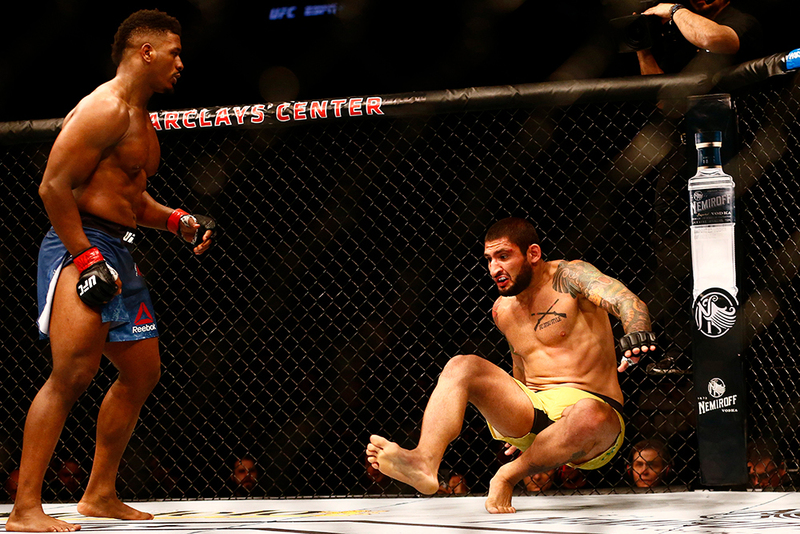 The UFC should continue to utilize him in the gatekeeper role at this point of his career, though with a couple more finishes like this one, who knows, maybe Teixeira can make a late run to the title once again. Many were skeptical when Donald Cerrone announced he would be returning to the UFC lightweight division in his mid thirties, and the UFC did him no favors matching him up against rising star Alexander Hernandez. Or so we thought. Cerrone showed there's levels to this game, as he turned back the clock and put on one of the best performances in years, knocking out Hernandez in the second round with a head kick and punches. Cerrone used his post-fight interview as an opportunity to call out Conor McGregor, and the UFC should consider booking this fight next, especially with McGregor taking to Twitter and accepting Cerrone's invitation to the rodeo. It looks like Joanne Calderwood has found her right weight class. After struggling as a strawweight, she's now 2-0 since moving up to flyweight, including an upset win over Ariane Lipski. Calderwood is now more than just a striker, as she's shown off a very nice ground game in her last couple of fights. She called out Jessica Eye for her next fight, and that's a matchup that makes a lot of sense, with the winner potentially getting the next flyweight title shot. It took Alonzo Menifield six months to finally make his official UFC debut, but it turned out to be worth the wait, as he viciously finished Vinicius Moreira in the first round. Menifield is now 7-0 in his MMA career with all of his wins coming by stoppage. At age 31 he's in his prime, and he looks like someone who could eventually be a challenger for UFC Light Heavyweight Champion Jon Jones. Cory Sandhagen showed the rest of the bantamweight division that he's a force to be reckoned with, as he defeated Mario Bautista via first-round submission. Sandhagen is now 3-0 in the UFC, and he's finished his last five fights overall. Along with Petr Yan and Nathaniel Wood, Sandhagen is part of the next wave of elite bantamweight prospects, and the UFC should give him a top-10 opponent his next time out. His original opponent before injury, John Lineker, makes a ton of sense. Heading into the card, Dennis Bermudez was riding a four-fight losing streak and needed a win to save his job with the UFC. With a unanimous decision win over Te Edwards on the early prelims, he did just that. But then Bermudez surprised the MMA world when he left his gloves on the Octagon floor and decided to retire from MMA. He'll leave the sport with a 17-9 record, including a 10-7 mark in the Octagon. MMA retirements rarely last long, though, and at age 32 it wouldn't surprise me to see Bermudez return to the Octagon in a couple of years.